The normal function of PKC is under the coordinated regulation of three major mechanisms: phosphorylation/ dephosphorylation, membrane targeting modules, and anchor proteins. First, the kinase must be processed by a series of ordered phosphorylations to become catalytically competent. Second, it must have its pseudosubstrate removed from the active site to be catalytically active, a conformational change driven by engaging the membranetargeting modules with ligand. Third, it must be localized at the correct intracellular location for unimpaired signaling. Perturbation at any of these points of regulation disrupts the physiological function of PKC . The function of PKC isozymes is controlled by phospho-rylation mechanisms that are required for the maturation of the enzyme. In addition to the processing phosphorylations, the function of PKC isozymes is additionally fine-tuned by both Tyr and Ser/Thr phosphorylations [8,9]. The conserved maturation phosphorylations are described below. The majority of PKC in tissues and cultured cells is phos-phorylated at two key phosphorylation switches: a loop near the active site, referred to as the activation loop, and a sequence at the carboxyl terminus of the kinase domain [10,11]. The carboxyl-terminal switch contains two sites: the turn motif, which by analogy with protein kinase A is at the apex of a turn on the upper lobe of the kinase domain, and the hydrophobic motif, which is flanked by hydrophobic residues (note that, in atypical PKCs, a Glu occupies the phospho-acceptor position of the hydrophobic motif). It is the phosphorylated species that transduces signals. While it had been appreciated since the late 1980s that PKC is processed by phosphorylation , the mechanism and role of these phosphorylations are only now being unveiled [7,9]. The first step in the maturation of PKC is phosphorylation by the phosphoinositide-dependent kinase, PDK-1, of the activation loop. This enzyme was originally discovered as the upstream kinase for Akt/protein kinase B  and was subsequently shown to be the activation loop kinase for a large number of AGC kinases, including all PKC isozymes [14-16]. The name PDK-1 was based on the phosphoinositide-dependence of Akt phosphorylation and is an unfortunate misnomer because the phosphorylation of other substrates (for example, the conventional PKCs) has no dependence on phos-phatidylinositol 3-kinase (PI3K) lipid products . Rather, PDK-1 appears to be constitutively active in the cell, with substrate phosphorylation regulated by the conformation of the substrate [18-20]. Completion of PKC maturation requires phosphorylation of the two carboxyl-terminal sites, the turn motif and hydrophobic motif. In the case of conventional PKCs, this reaction occurs by an intramolecular autophosphorylation mechanism . Autophosphorylation also accounts for the hydrophobic motif processing of the novel PKCe ; however, it has been suggested that another member of this family, PKCS, may be the target of a putative hydrophobic motif kinase . 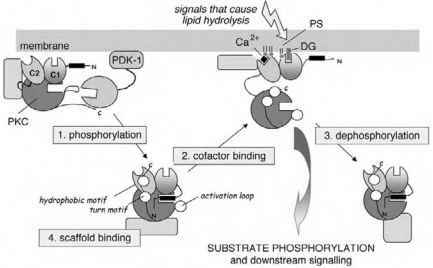 Research in the past few years has culminated in the following model for PKC phosphorylation. Newly synthesized enzyme associates with the plasma membrane, where it adopts an open conformation with the pseudosubstrate exposed, thus unmasking the PDK-1 site on the activation loop [17,24]. It is likely held at the membrane by multiple weak interactions with the exposed pseudosubstrate, the C1 domain, and the C2 domain (because the C1 and C2 ligands are absent, these domains are weakly bound via their interactions with anionic phospholipids). PDK-1 docks onto the carboxyl terminus of PKC, where it is positioned to phos-phorylate the activation loop . This phosphorylation is the first and required step in the maturation of PKC; mutation of the phospho-acceptor position at the activation loop to Ala or Val prevents the maturation of PKC and results in accumulation of unphosphorylated, inactive species in the detergent-insoluble fraction of cells [26,27]. Completion of PKC maturation requires release of PDK-1 from its docking site on the carboxyl terminus. Physiological mechanisms for this release have not yet been elucidated, but it is interesting that over-expression of peptides that have a high affinity for PDK-1 promotes the maturation of PKC . One such peptide is PIF, the carboxyl-terminus of PRK-2, which has a hydrophobic phosphorylation motif with a Asp at the phospho-acceptor position . Release of PDK-1 unmasks the carboxyl terminus of PKC, allowing phosphorylation of the turn motif and the hydrophobic motif [7,10]. While the phosphorylation of conventional PKCs is constitutive, the dephosphorylation appears to be agonist stimulated . Both phorbol esters and ligands such as tumor necrosis factor a (TNFa) result in PKC inactivation and dephosphorylation [29-31]. In addition, serum selectively promotes the dephosphorylation of the activation loop site in conventional PKCs, thus uncoupling the phosphorylation of the activation loop from that of the carboxyl-terminal sites . The hydrophobic site of PKCe has also been reported to be selectively dephosphorylated by a rapamycin-sensitive phosphatase . It is likely that the uncoupling of the dephosphorylation of these sites has contributed to confusion as to whether the hydrophobic site is regulated by its own upstream kinase rather than autophosphorylation . The translocation from the cytosol to the membrane has served as the hallmark for PKC activation since the early 1980s [33,34]. The molecular details of this translocation have emerged from abundant biophysical, biochemical, and cellular studies showing that diacylglycerol acts like molecular glue to recruit PKC to membranes, an event that, for conventional PKCs, is facilitated by Ca2+ [35-37]. Both in vitro and in vivo data converge on the following model for the translocation of conventional PKC in response to elevated Ca2+ and diacylglycerol [35,38]. In the resting state, PKC bounces on and off membranes by a diffusion-limited reaction. However, its affinity for membranes is so low that its lifetime on the membrane is too short to be significant. Elevation of Ca2+ results in binding of Ca2+ to the C2 domain of this soluble species of PKC. This Ca2+-bound species has a dramatically enhanced affinity for the membrane, with which it rapidly associates. The membrane-bound PKC then diffuses in the two-dimensional plane of the membrane, searching for the much less abundant ligand, diacylglycerol. This search for diacylglycerol is considerably more efficient from the membrane than one initiated from the cytosol. Following collision with, and binding to, diacyl-glycerol, PKC is bound to the membrane with sufficiently high affinity to allow release of the pseudosubstrate sequence and activation of PKC. Decreases in the level of either second messenger weaken the membrane interaction sufficiently to release PKC back into the cytosol. Note that if PMA is the C1 domain ligand, PKC can be retained on the membrane in the absence of elevated Ca2+ because this lig-and binds PKC two orders of magnitude more tightly than diacylglycerol . Similarly, if Ca2+ levels are elevated sufficiently, PKC can be retained at the membrane in the absence of a C1 ligand. Novel PKC isozymes translocate to membranes much more slowly than conventional PKCs in response to receptor-mediated generation of diacylglycerol because they do not have the advantage of pre-targeting to the membrane by the soluble ligand, Ca2+ . Atypical PKC isozymes do not respond directly to either diacylglycerol or Ca2+. The control of subcellular localization of kinases by scaffold proteins is emerging as a key requirement in maintaining fidelity and specificity in signaling by protein kinases . PKC is no exception, and a battery of binding partners for members of this kinase family have been identified [42-45]. These proteins position PKC isozymes near their substrates, near regulators of activity such as phosphatases and kinases, or in specific intracellular compartments. Disruption of anchoring can impair signaling by PKC, and Drosophila pho-toreceptors provide a compelling example. Mislocalization of eye-specific PKC by abolishing its binding to the scaffold protein, ina D, disrupts phototransduction . Unlike protein kinase A binding proteins (AKAPs) , there is no consensus binding mechanism for interaction of PKC with its anchor proteins. Rather, each binding partner identified to date interacts with PKC by unique determinants and unique mechanisms. Some binding proteins regulate multiple PKC isozymes, while others control the distribution of specific isozymes. There are binding proteins for newly synthesized unphosphorylated PKC, phosphorylated but inactive PKC, phosphorylated and activated PKC, and dephosphorylated, inactivated PKC [43,45]. Anchoring proteins for PKC have diverse functions—some positively regulate signaling while others negatively regulate it. An emerging theme is that many scaffolds bind multiple signaling molecules in a signaling complex; for example, AKAP 79 binds PKA, PKC, and the phosphatase calcineurin . The physical coupling of kinases and phosphatases underscores the acute regulation that each must be under to maintain fidelity in signaling. (black rectangle), allowing access of the upstream kinase, PDK-1, to the activation loop. PDK-1 docks onto the car-boxyl terminus of PKC. Following its phosphorylation of the activation loop and release from PKC, the turn motif and hydrophobic motif are autophosphorylated. The mature PKC is released into the cytosol, where it is maintained in an auto-inhibited conformation by the pseudosubstrate (middle panel), which has now gained access to the substrate-binding cavity (open rectangle in the large circle representing the kinase domain of PKC). It is this species that is competent to respond to second messengers. Generation of diacylglycerol and, for conventional PKCs, Ca2+ mobilization provide the allosteric switch to activate PKC. This is achieved by engaging the C1 and C2 domains on the membrane (Fig. 2, right panel), thus providing the energy to release the pseudosubstrate from the active site, allowing substrate binding and catalysis. In addition to the regulation by phosphorylation and cofactors, anchoring/scaffold proteins (stippled rectangle) play a key role in PKC function by positioning specific isozymes at particular intracellular locations [43,45]. Following activation, PKC is either released into the cytosol or, following prolonged activation, dephos-phorylated and downregulated by proteolysis.